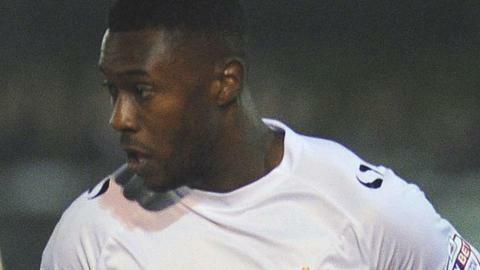 Jennison Myrie-Williams struck a late winner as Port Vale come from behind to beat local rivals Crewe at Gresty Road. On-loan Man City teenager George Evans' stunning 25-yard right-foot volley put Crewe ahead 10 minutes from the break, the first goal of his career. But left-back Rob Taylor marked his first appearance since April to level for Vale just eight minutes later. And Ben Williamson crossed for Myrie-Williams to win the game seven minutes from time, firing home from six yards. Vale's win lifted them to ninth in League One, just one point outside the play-off places, while Crewe remained second bottom, as their winless run was extended to seven games. Crewe's lead was deserved after Evans and Byron Moore had already gone close but it seemed to spark Micky Adams' side into life. Taylor squirmed the ball under debutant loan keeper Neil Etheridge top level, before the unmarked Myrie-Williams won it when he nipped in to stab home at the back post after Williamson's cross had drifted along the Alex six-yard box. "We started well but weren't able to capitalise on our goal. "It was a double deflection for their equaliser, which showed that things just aren't going for us at the moment. "But we were a team today. which we haven't been lately and it gave me a lot of hope. The lads had a real go, worked hard for each other and have everything they had. "The keeper made two or three great saves second half and looks like he might be a good acquisition for us." "It panned out like we thought it would, Crewe came out with fire in their bellies, took us by surprise and went a goal ahead. "But we stood strong, stayed composed and we thoroughly deserved it on our second-half performance. "It was a gamble bringing in Rob Taylor at left-back but he got a goal and played well. He was tested by Byron Moore a couple of times, but Moore will do that to anyone. "Rob's not played many games but he's picked up his training in recent weeks. It might have dawned on him that he's out of contract in the summer and he'd better start playing." Match ends, Crewe Alexandra 1, Port Vale 2. Second Half ends, Crewe Alexandra 1, Port Vale 2. Ryan Colclough (Crewe Alexandra) is shown the yellow card. Foul by Ryan Colclough (Crewe Alexandra). Attempt saved. Robert Taylor (Port Vale) left footed shot from the centre of the box is saved in the centre of the goal. Attempt missed. Abdul Osman (Crewe Alexandra) right footed shot from outside the box misses to the right from a direct free kick. Mark Ellis (Crewe Alexandra) wins a free kick in the defensive half. Foul by Ben Williamson (Port Vale). Substitution, Crewe Alexandra. Thierry Audel replaces Adam Dugdale. Foul by Kelvin Mellor (Crewe Alexandra). Gavin Tomlin (Port Vale) wins a free kick on the left wing. Substitution, Port Vale. Chris Birchall replaces Jennison Myrie-Williams. Abdul Osman (Crewe Alexandra) wins a free kick in the defensive half. Goal! Crewe Alexandra 1, Port Vale 2. Jennison Myrie-Williams (Port Vale) right footed shot from the right side of the six yard box to the centre of the goal. Assisted by Ben Williamson. Substitution, Crewe Alexandra. Chukwuemeka Aneke replaces Vadaine Oliver. Attempt missed. Jennison Myrie-Williams (Port Vale) right footed shot from the right side of the box misses to the left. Foul by Vadaine Oliver (Crewe Alexandra). Chris Lines (Port Vale) wins a free kick in the defensive half. Substitution, Crewe Alexandra. Ryan Colclough replaces Ajay Leitch-Smith. Hand ball by Ben Williamson (Port Vale). Corner, Crewe Alexandra. Conceded by Richard Duffy. Attempt saved. Kelvin Mellor (Crewe Alexandra) header from the centre of the box is saved in the top right corner. Attempt missed. Chris Lines (Port Vale) right footed shot from the centre of the box is too high. Foul by George Evans (Crewe Alexandra). Gavin Tomlin (Port Vale) wins a free kick in the defensive half. Substitution, Port Vale. Gavin Tomlin replaces Doug Loft because of an injury. Attempt missed. Mark Ellis (Crewe Alexandra) header from the centre of the box is too high following a corner. Corner, Crewe Alexandra. Conceded by Chris Lines. Attempt missed. Ben Williamson (Port Vale) left footed shot from outside the box is too high. Vadaine Oliver (Crewe Alexandra) wins a free kick in the attacking half. Foul by Anthony Griffith (Port Vale). Attempt missed. Doug Loft (Port Vale) left footed shot from the left side of the box is close, but misses to the left. Corner, Port Vale. Conceded by Harry Davis. Foul by Byron Moore (Crewe Alexandra). Richard Duffy (Port Vale) wins a free kick in the attacking half. Attempt saved. Doug Loft (Port Vale) left footed shot from the centre of the box is saved in the centre of the goal.